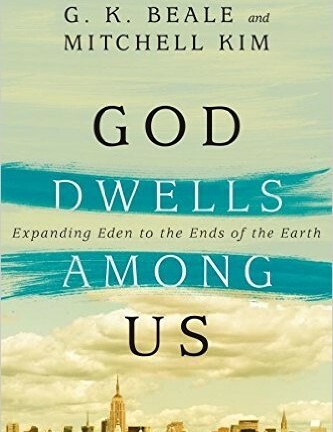 God Dwells among Us: Expanding Eden to the Ends of the Earth, by G. K. Beale and Mitchell Kim. Downers Grove, IL: InterVarsity Press, 2014. 211 pp. $17.00. Gregory Beale is currently a professor of New Testament and Biblical Theology at Westminster Theological Seminary, where he is the occupant of the J. Gresham Machen Chair of New Testament. Mitchell Kim is the senior pastor of Living Water Alliance Church as well as a writer and blogger. God Dwells among Us is the result of Kim producing a sermon series based on an earlier book by Beale and then converting the series into book form. The purpose of the book is to trace Eden as both the prototype of communion with God and the goal of creation throughout time, from the fall to Eden’s restoration in the New Jerusalem. It argues that Eden is the divine sanctuary where God dwelt with his people, whose purpose was to expand Eden, and thereby the presence of God, to the ends of the earth. After man’s disobedience, the story of humanity is God’s plan to restore the universe to the state of Eden. The opening chapter defines Eden as the first temple and place of God’s presence, arguing that it was God’s intent for Adam to expand Eden to encompass the whole earth. The second chapter explains that the cultural mandate to be fruitful and multiply is a command to expand Eden through worship as God’s image-bearers. The third follows this commission after the fall through the patriarchs, while the fourth defines the tabernacle of Israel as a “remix” of Eden, allowing the presence of God to travel with his people even during their exile in the desert. The fifth chapter explores the promises through the prophets that Eden would be restored, while the sixth describes Christ as the new temple to replace the failed one in Jerusalem. The seventh chapter presents the church as the continuation of Christ in replacing the temple, while the eighth continues that line of reasoning to establish Christian believers as priests of that temple. In chapter nine the temple is expanded to encompass all of the cosmos. Finally, the authors suggest some reasons that readers may not have considered this interpretation, while the eleventh chapter lays out some practical consequences for the church. The authors present their thesis with extensive biblical support. Eden as a sanctuary and temple is established through several references, including Ezekiel 28, where Eden is referred to as containing “sanctuaries” and being the “Holy mountain of God” (18). They analogize the river flowing out of Eden to the river flowing from the throne of God in Revelation (21), showing a gradation of holiness from the river’s source, to its banks, to flowing out to the four corners of the earth, reflecting the layers of the temple and the layers of Eden. The book then establishes Adam as the “priest” of this temple, having been given the duty to “work it and keep it” (24), including a duty both to guard it against outside intrusions and to expand the garden (35). Having failed in the first duty, and thus in the second, mankind is expelled from the garden, and sin has instead filled the earth through the descendants of Adam. The authors then argue that through the patriarchs, God established little spaces of “sanctuary” by revealing himself to them. His presence thus spread beyond one locale, establishing pockets of God’s presence until the coming of the tabernacle and then the temple, when it is again condensed into one sacred space (46–48). The authors then describe the tabernacle as “Eden remixed” in a context of sin, and by extension, a type of the entire cosmos. They draw parallels between the seven days of creation and seven biblical speeches about the tabernacle (61). They cover Christ establishing himself (84), and then the church (100), as the new temple. They then argue that the church must grow through the word of God being taken out by “image-bearers” into the world and continuing the cultural mandate given to Adam by expanding the temple-church (104–6). By extension, if the church is a temple, then believers are the priests, an argument supported by passages referring to Christians as a royal priesthood, who dwell in his presence as caretakers of the temple (113). Finally, they move to the eschatological temple, where the Holy of Holies has been expanded to encompass all of the cosmos. They argue that the “new heaven and new earth” of Revelation and the “new Jerusalem” are both referring to all of the cosmos (137–38). Certain points are well supported scripturally, including the concept of Eden as a sanctuary of God, Christ as the Temple (literally “God with us”), and the church as a temple/priesthood. All of these are rather explicitly contained in Scripture, and the authors give ample citations for their point. Overall, this book has some intriguing and useful points concerning the concept of viewing the Bible through the lens of the temple. It should be accessible to pastors and those with education but veers often enough into academic writing that it may be slightly difficult for the layperson, though by no means impossible.